It's not a literary work but it's not a gaming product either. 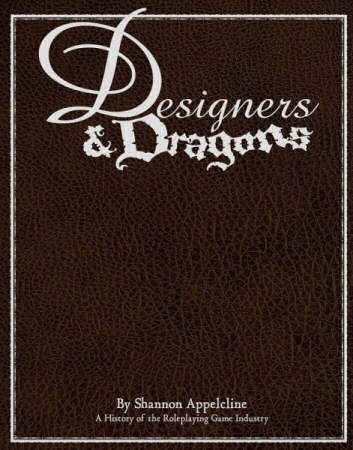 Sometime ago, a friend of mine lent me a copy of this Designers and Dragons, by Shannon Appelcline, spanning the entire story of our hobby with occasional incursions into wargamming and boardgames. There is no other way to put it: it's a monumental work. The book is a 400-page thick volume, covering the most influent companies that helped shape roleplaying games from the early days to today. 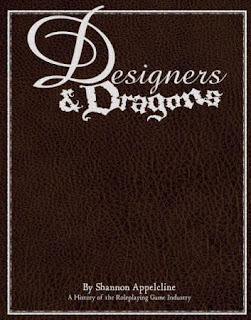 It begins, quite naturally, with TSR: how D&D evolved from Chainmail; how Gygax and friends managed their business in the 70s; the company's evolution throughout the 80s and 90s. It is a very complete account, and this is only one of the many companies this book covers. The book is divided in time periods, even if a company's history extends throughout several time periods. For instance, the first wave, which begins in 1970, includes those companies that first appeared on the scene and set the foundations for later companies, such as TSR, Judges Guild, GDW, Games Workshop or Flying Buffalo. The second wave includes those companies that were most influential to the hobby in the 80s but among them is Avalon Hill, founded in 1958. This organization is very clear and helps relate which company did what in what period, and how it contributed to roleplaying games. A recurrent pattern I noticed in most these accounts is the meteoric rise of a company, then a period of financial difficulties and, later, the fall. Either the company is sold (like TSR) or just dissolved (like Judges Guild). Others, like Steve Jackson, turn to more profitable products. Others still, linger in a sort of limbo, trying to recover from bad decisions and other missteps, such as Palladium. My interest on this book was partly derived by my interest in knowing the history of those companies that contributed to my gaming career, and whose games I played the most - Chaosium (Call of Cthulhu), ICE (MERP), West End Games (Star Wars, Torg), Pinnacle (Savage Worlds, Deadlands) and a few others - but also because of my recent interest in old school companies, as pertains to this blog. There aren't enough words of praise for this work. Whether you read it wholesale or pick and read only those companies that interest you most, there's something here that everyone will find interesting. As I said, this is a monumental work, and I can only imagine how many hours of research and lengthy interviews were involved in creating this book. Kudos to Shannon. Highly recommended. I can only agree by 100%. This book is just plain awesome!